notes Late Art Deco era, 14k solid gold, savonette type, hunting case pocket chronometer with 24 hour dial, unsigned, made in Switzerland, circa mid 1930s. 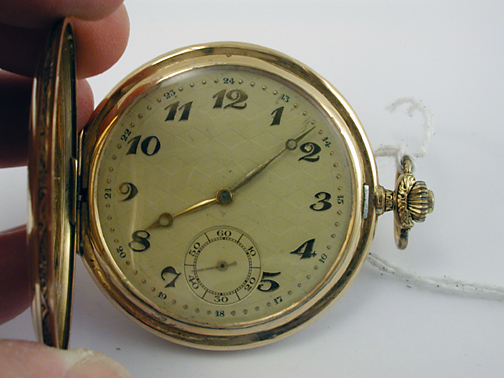 (Size note provided) This is a 14k yellow gold four leaf hunting case pocket watch with the fluted and embossed suppressed ball pendant and oval bow placed at the three position (savonette) opposite the case hinge. The outer covers have geometric guilloche designs typical of the Art Deco era with a cameo for the original owner's initials, 'CS'. The edge of the case is filled with embossed scrollwork. 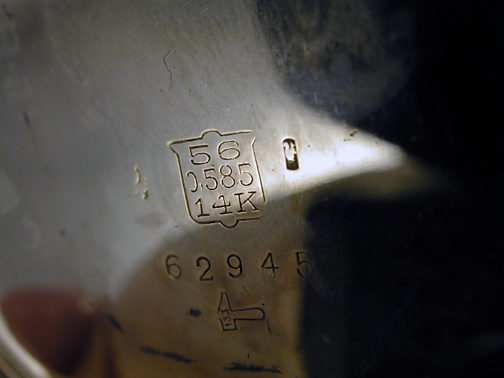 The inside of the cover reveals the designation of 14k solid gold next to the squirrel, the Swiss hallmark for such gold. Note the hammer with handle, marked 133, which is the quality control mark of a specific Swiss watch company (not identified). 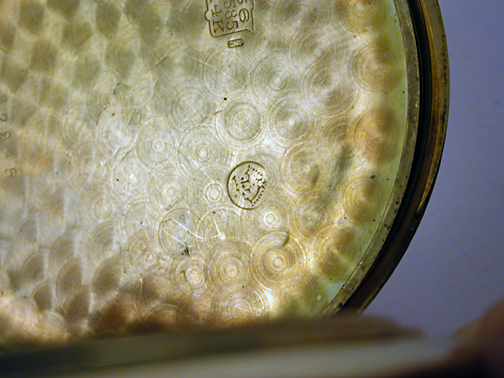 In addition, there is a faint trace of the German gold hallmark, the crown in a circle, indicating that the piece was sold in Germany. There are aftermarket marks inside the case, one of which is Mu?ller. There are numerous Mu?ller watchmakers in both Germany and in the German speaking cantons of Switzerland. 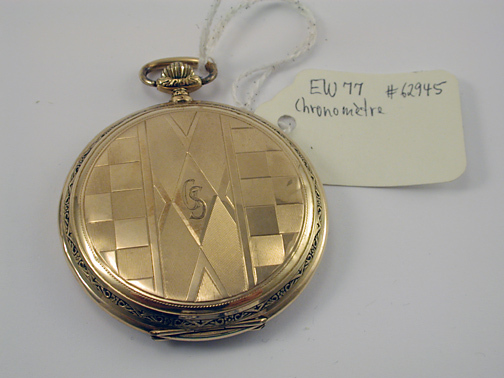 The cuvette indicates or suggests that this Swiss company has won several medals in watch Competitions, but they are unidentified. The cuvette is signed as having '17 jewels, Chronometre, Precision lever escapement'. An unsigned, silvered linear guilloche, 24 hour dial with applied gold Breguet Arabic hours (1-12), gold dotted minute ring with Arabic hours (13-24) placed along the edge of the dial. Sunken subsidiary seconds @6. 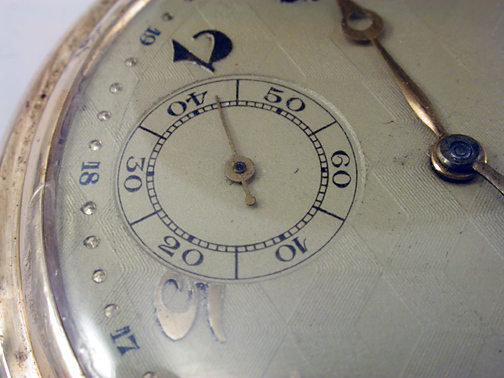 There are 'Antique Breguet' hour and minute hands. 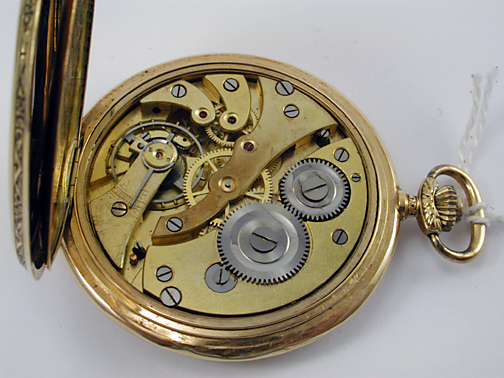 Finger bridge and half plate gilt movement, stem wound and stem set, serial number 62945, curved center wheel bridge, exposed ratchet and barrel gearing, Swiss type index regulator, bimetallic compensation balance wheel and breguet hairspring. Dial and outer covers are nicely matched in term of the textured guilloche designs and in very good condition. There is no doubt this is Swiss made and perhaps for the German market. The use of the terms precision and chronometre on the cuvette may have to be taken with a grain of salt, especially since my impression of the various medallions engraved into the cuvette appear to be very generic rather than specific and detailed.